Skin cancer is a malignant growth of the external surface or epithelial layer of the skin. Skin cancer is the growth of abnormal cells capable of invading and destroying other associated skin cells. Skin cancer is often subdivided into either melanoma or non-melanoma. Melanoma is a dark-pigmented, usually malignant, tumor arising from a skin cell capable of making the pigment melanin (a melanocyte). Melanoma can spread throughout the body via the bloodstream or lymphatic system. Non-melanoma skin cancer most often originates from the external skin surface as a squamous cell carcinoma or a basal cell carcinoma. The cells of a cancerous growth originate from a single cell that reproduces uncontrollably, resulting in the formation of a tumor. Exposure to sunlight is documented as the main cause of almost 800,000 cases of skin cancer diagnosed each year in the United States. The incidence increases for those living where direct sunshine is plentiful, such as in regions near the equator. Basal cell carcinoma affects the skin’s basal layer and has the potential to grow progressively larger in size, although it rarely spreads to distant areas (metastasizes). Basal cell carcinoma accounts for 80% of skin cancers (excluding melanoma), whereas squamous cell cancer makes up about 20%. Squamous cell carcinoma is a malignant growth of the external surface of the skin. Squamous cell cancers metastasize at a rate of 2–6%, with up to 10% of lesions affecting the ear and lip. Cumulative sun exposure is considered a significant risk factor for non-melanoma skin cancer. High incidence has been noted in individuals with freckles, light hair, and light complexion; in individuals with darker skin, the palms, soles, mucous membranes, and other areas of light pigmentation are the most common sites for melanomas. Pre-existing moles can change into melanomas, and should be observed for any particular change in appearance, specifically the classic ABCD appearance, in which asymmetrical borders, colors, and diameter are observed. Lesions typically are circular with irregular or asymmetrical borders. Melanomas typically have a combination of colors, including tan, brown, black, or gray; there may also be a dull pink or rose pigmentation within a small area of the lesion. The diameter of a malignant melanoma is typically greater than that of a pencil eraser. There is evidence suggesting that early intense sun exposure causing blistering sunburn in childhood may also play an important role in the cause of non-melanoma skin cancer. Basal cell carcinoma most frequently affects the skin of the face, with the next most common sites being the ears, the backs of the hands, the shoulders, and the arms. It is prevalent in both sexes, and most commonly occurs in people over the age of 40. Basal cell carcinoma usually appears as a small skin lesion that persists for at least three weeks. This form of non-melanoma cancer looks flat and waxy, with the edges of the lesion translucent and rounded. The edges also contain small fresh blood vessels. An ulcer found in the center gives the lesion a dimpled appearance. Basal cell carcinoma lesions vary from 4–6 mm in size, but can slowly grow larger if left untreated. Squamous cell carcinoma also involves skin exposed to the sun, such as the face, ears, hands, or arms. This form of non-melanoma cancer also is most common among people over the age of 40. Squamous cell carcinoma presents itself as a small, scaling, raised bump on the skin with a crusting ulcer in the center, but without itching. Basal cell and squamous cell carcinomas can grow more easily when people have a suppressed immune system because they are taking immunosuppressive drugs or are exposed to radiation. Some people must take immunosuppressive drugs to prevent the rejection of a transplanted organ or because they have a disease in which the immune system attacks the body’s own tissues, referred to as autoimmune illnesses; others may need radiation therapy to treat another form of cancer. Because of the increased risk of skin cancer, all people taking these immunosuppressive drugs or receiving radiation treatments should undergo complete skin examination at regular intervals. If proper treatment is delayed and the tumor continues to grow, the tumor cells can spread, or metastasize, to other muscles, bones, nerves, and possibly to the brain. About 1–2% of all skin cancers develop within burn scars; squamous cell carcinomas account for about 95% of these cancers, with 3% being basal cell carcinomas and the remainder malignant melanomas. To diagnose skin cancer, doctors must carefully examine the lesion and ask the patient how long it has been there, whether it itches or bleeds, and other questions about the patient’s medical history. If skin cancer cannot be ruled out, a biopsy is performed, in which a sample of the tissue is removed and examined under a microscope. A definitive diagnosis of melanoma, squamous, or basal cell cancer can only be made with microscopic examination of the tumor cells. Once skin cancer has been diagnosed, the stage of the disease’s development is determined. The information from the biopsy and staging allows the physician and patient to plan for treatment and possible surgical intervention. Alternative medicine aims to prevent rather than treat skin cancer. Vitamins have been shown to prevent sunburn and possibly skin cancer. Some dermatologists have suggested that taking antioxidant vitamins E and C by mouth may help prevent sunburn. In one particular study, men and women took these vitamins for eight days prior to being exposed to ultraviolet light. The researchers found that those who consumed vitamins required about 20% more ultraviolet light to induce sunburn than did people who did not take vitamins. This is the first study that indicates the oral use of vitamins E and C increases resistance to sunburn. These antioxidants are thought to reduce the risk of skin cancer and are thought to provide protection from the sun even if taken in lower doses. Other antioxidant nutrients, including beta carotene , selenium, zinc, and the bioflavonoid quercetin , may also help prevent skin cancer, as may such antioxidant herbs as bilberry (Vaccinium myrtillus) , hawthorn (Crataegus laevigata) , turmeric (Curcuma longa), and ginkgo (Ginkgo biloba) . A team of researchers at Duke University reported in 2003 that topical application of a combination of 15% vitamin C and 1% vitamin E over a four-day period offered significant protection against sunburn. The researchers suggest that this combination may protect skin against aging caused by sunlight as well. Another antioxidant that appears to counter the effects of severe sun exposure is superoxide dismutase, or SOD. SOD must be given in injectable form, however, because it is destroyed in the digestive tract. As of 2003, researchers are also looking at botanical compounds that could be added to skin care products applied externally to lower the risk of skin cancer. Several botanical compounds have been tested on animals and found to be effective in preventing skin cancer, but further research needs to be done in human subjects. A wide surgical removal of the melanoma and surrounding tissue is usually necessary. Surgery may also include removal of affected lymph nodes, usually followed by skin grafting, which is a process in which a piece of skin that is taken from a donor area replaces the skin removed. Since the early 1990s, some melanomas have been treated with chemotherapy (usually carmustine or lomustine); other biological therapies are also being used as of 2003. A variety of treatment options are available for those diagnosed with non-melanoma skin cancer. Some carcinomas can be removed by cryosurgery, the process of freezing with liquid nitrogen. Uncomplicated and previously untreated basal cell carcinoma of the torso and arms is often treated with curettage and electrodesiccation, which is the scraping of the lesion and the destruction of any remaining malignant cells with an electrical current. Moh’s surgery, or removal of a lesion layer by layer down to normal margins, is an effective treatment for both basal and squamous cell carcinoma. Radiation therapy is best reserved for older, debilitated patients, or those whose tumors are considered inoperable. Laser therapy is sometimes useful in specific cases; however, this form of treatment is not widely used to treat skin cancer. Both squamous and basal cell carcinoma are curable with appropriate treatment. Early detection remains critical for a positive prognosis. 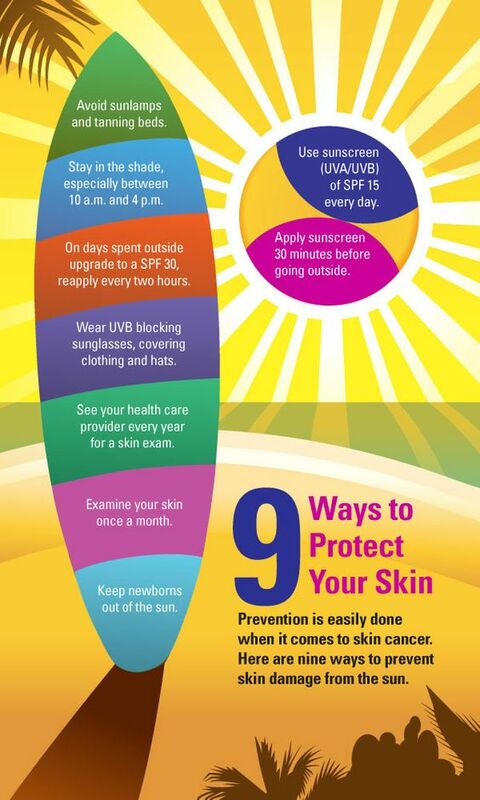 Avoiding exposure to the sun reduces the incidence of non-melanoma skin cancer. Sunscreen with a sun-protective factor (SPF) of 15 or higher is helpful in prevention, along with a hat and clothing to shield the skin from sun damage. Individuals who are physically active while exposed to sunlight should consider using waterproof sunscreen, or reapply it. There are many different brands of sunscreen for those with certain skin allergies. People should examine their skin monthly for unusual lesions, especially if previous skin cancers have been experienced. Advances in photographic technique have now made it easier to track the development of moles with the help of whole-body photographs. A growing number of hospitals are offering these photographs as part of outpatient mole-monitoring services.